As Washington state lawmakers return to Olympia on Monday for the 2017 legislative session, education funding looms large. Gov. 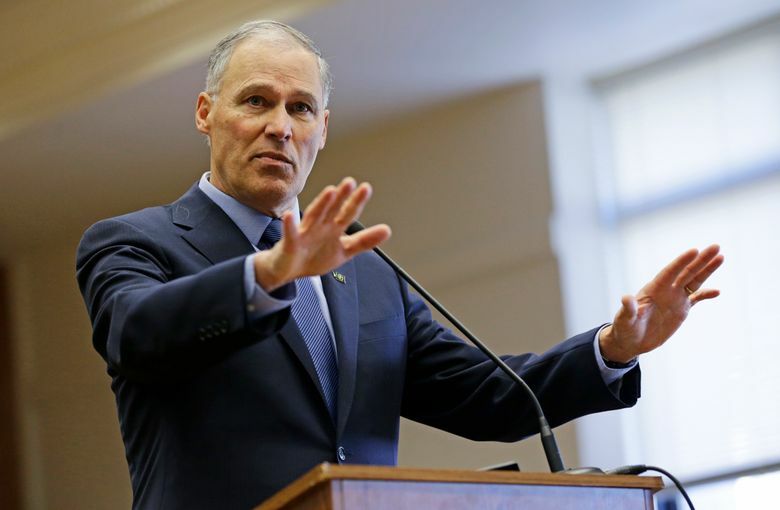 Jay Inslee has led the way on negotiations with a large proposed state budget increase. Somebody may want to hand out copies of that to state lawmakers Monday as they return to what’s expected to be a bruising and difficult 2017 legislative session. At the center of negotiations over a 2017-19 state operating budget, Inslee and lawmakers are tasked with fully funding K-12 education to satisfy the state Supreme Court’s 2012 McCleary decision. For his own proposal, Inslee decided to go big. He last month proposed an operating budget that calls for a more than $8 billion increase over the current spending plan, including roughly $4.4 billion from new taxes through 2019. The centerpiece of Inslee’s proposed $46.7 billion budget is $2.75 billion to address teacher and school-worker salaries. Figuring out how the state will pay for those salaries is the last big remaining part of the McCleary decision. Inslee has also proposed spending hundreds of millions of dollars for other education needs, such as teacher mentoring and more school nurses and counselors. His budget would spend $732 million for state employee raises. And there’s $300 million more for the state’s mental-health system — itself the subject of scrutiny and various court orders in recent years. Inslee’s proposal would hike spending about 22 percent over the $38.2 billion two-year budget enacted in 2015. Counting adjustments made in last year’s supplemental budget, the increase would be about 21.4 percent. If passed, Inslee’s proposal would be the fourth-highest budget increase by percentage since 1975, according to state data. The governor concedes, however, that it would be “a longshot” for his proposal to pass in full. Republicans are expected to vigorously oppose the tax package, and have argued that a McCleary solution will cost less than anticipated. But Inslee describes his plan as a way for legislators to think about the challenges facing them. Republican lawmakers have already criticized Inslee’s proposed taxes — which include a tax on capital gains, a carbon tax and an increase in part of the state business and occupation tax. “The enormous size is kind of astounding,” said Braun, who has been skeptical of the proposal for more nurses and school counselors, as well as the raises for state workers. But Republicans so far have not issued their own estimate of how much it will cost to satisfy the McCleary decision, which said the state is failing its constitutional duty to pay for basic education. As a result, the Education Funding Task Force, created to come up with solutions for McCleary, has been unable to find common ground for a bipartisan set of recommendations. Republicans, for their part, released a set of “guiding principles” that give few specifics for how to finish the job. Meanwhile, the clock is ticking toward a court-imposed deadline to have an education-funding plan approved by the end of the legislative session. Lawmakers and Inslee have poured at least $2.3 billion into the education system in recent years to satisfy the McCleary decision. But the court in 2014 issued a contempt order — later adding a daily fine — for the state’s lack of progress on a full education-funding plan. The last big remaining part of the decision is the one that involves pay for teachers and school workers. Justices ruled that basic education the state is required to provide includes salaries for those employees. Currently, school districts use local property-tax levies to pay a big chunk of teacher salaries. And so Inslee and lawmakers must come up with a way for the state to assume those costs. Previous estimates have pegged a solution at $3.5 billion every two years. Inslee’s plan would spend $2.75 billion on school-worker pay in the 2017-19 budget cycle. Most of that sum is phased in the second year, meaning the two-year cost after 2019 would be higher. But under Inslee’s plan, three-fourths of the state’s households and businesses would see a cut in property taxes. No school districts would have a property-tax increase. Braun said that based on the task force’s work, he believes the number to satisfy McCleary could be lower, like $1.5 billion per year or less. And Braun said he’d like to see a compromise that makes sure local property-tax levies don’t creep back up over time. The guiding principles that Republicans called for also include, among other things, a hike in beginning teacher pay and reforming collective-bargaining laws. If Republicans don’t like his proposals to fund education, Inslee said, he’s open to other ideas for new revenue. Braun has also been a critic of the proposed raises for state workers, which include a mix of negotiated and arbitrated union contracts. A Republican budget proposal may feature a smaller package for state workers, with flat per-person raises, he said. It’s an idea that GOP lawmakers proposed in 2015 before ultimately approving a broader package of contract agreements in that budget. The governor, however, said he would not be open to such an approach. One issue Inslee and Braun agree on is the need to move mental-health treatment toward a more community-based model. Inslee’s budget proposal would add 1,000 new mental-health beds around the state, as well as fund 700 new mental-health workers. It also would eventually move most of the civilly committed patients out of Eastern State and Western State, Washington’s two psychiatric hospitals. That plan would help address several problems at Western State, the larger hospital. The facility has struggled with a shortage of staff and beds and has been at risk of losing its federal certification. Meanwhile, some patients can’t be discharged because there is nowhere in the community for them to go. While Braun said the state must go slowly and be careful on a shift to a community-based mental-health system, “Philosophically, that’s one of the things we’re pretty close on,” he said.